During the revitalization of Lexington Kentucky’s downtown area, the historic Fayette County Courthouse required major renovations to accommodate the additional planned retail and restaurant space. The project involved increasing loads on existing footings, as well as dropping the basement elevation and undermining the existing historic foundation. 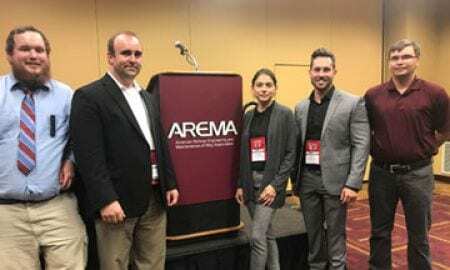 Justin Anderson, Project Development Engineer at GeoStabilization and second from left in the photo, recently participated in a five-person panel to promote the railroad industry to potential future professionals. Robert Huber – Marliave Scholar! 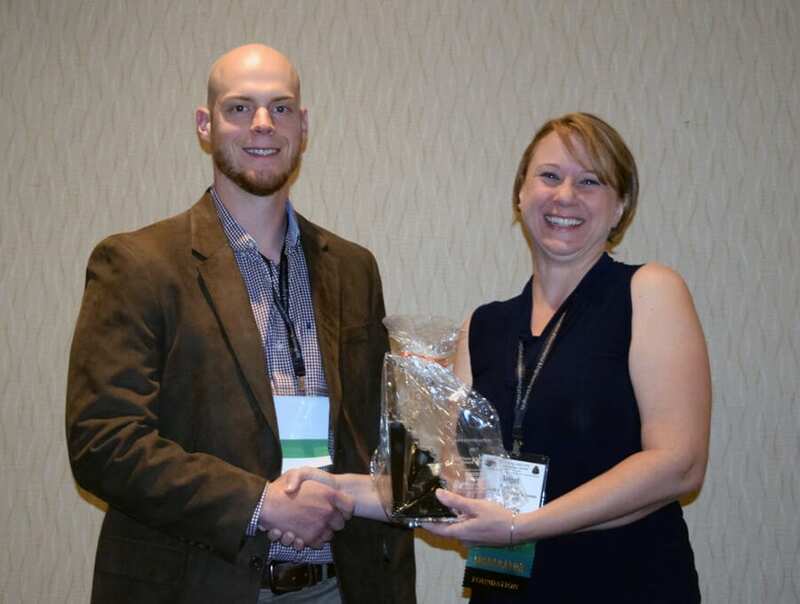 GeoStabilization International would like to recognize Robert Huber, a “two-time” summer intern and part-time employee, for being awarded the Marliave Scholarship from the Association of Environmental & Engineering Geologists. 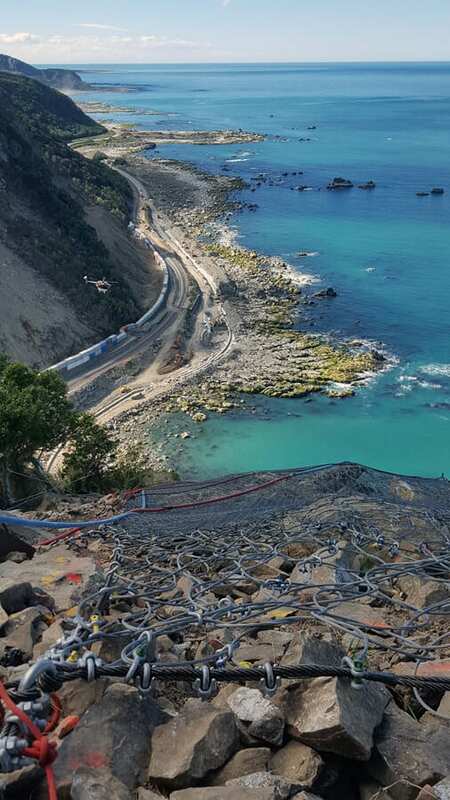 Hiway GeoStabilization, our joint venture partner in New Zealand, is currently working on the Kaikoura Landslide for North Canterbury Transport Infrastructure Recovery (NCTIR). At the apex of rockfall mitigation - view from the top of the rockfall drape that will protect the transportation links to Kaikoura. Last November a 7.8-magnitude earthquake caused more than 100,000 cubic meters of rock and debris to tumble down and bury the road below Ohau Point in New Zealand. The abseilers [Rock Remediation Technicians (RRTs)] of Hiway GeoStabilization (HGS) have been tasked to remove any future dangers and secure the remaining rock with a ring net and high tensile steel wire mesh. GeoStabilization International® was recently recognized as a Mile High Level Partner by the USO for our continuing support. USO Denver’s programs include emotional wellness, entertainment, informational services, food, holiday celebrations, and transition programs that GeoStabilization believes are essential for our military service members and we are honored to support their mission. Earlier this year the Gilman Tunnels in Santa Fe, New Mexico began suffering an increasing amount of falling rock, and the fracturing around the portals of this historic landmark started accelerating. 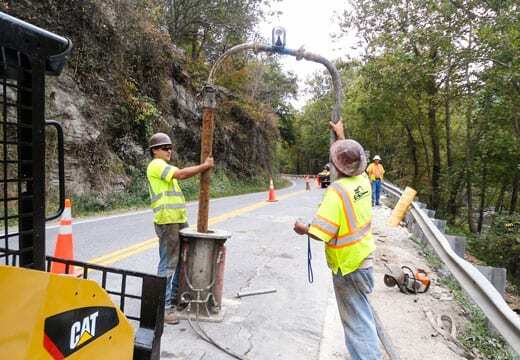 GeoStabilization International (GSI) was called upon to remove the immediate rock fall danger as well as stabilize the rock cliffs surrounding the tunnels. A quarry in Atlanta, Georgia is being transformed into a water storage facility to ensure the city has a 30+ day supply of raw water to use in the event of a natural disaster. To ensure the quarry was safe for all personnel during the conversion process, GeoStabilization was contracted to improve its geologic stability. For the past several years GSI has hosted summer interns in our highly competitive program.